This post originally appeared on the Vero blog. It's important to understand when to sell your product and when to learn more about your potential customers. Many marketers believe that acquiring an email address is the only thing standing between them and a sale. Once they can start the drip campaign, the deal is as good as sealed. Like all businesses, we are learning through trial and error. I want to share a quick story from our own marketing to illustrate something that most marketers struggle with: selling vs. learning. 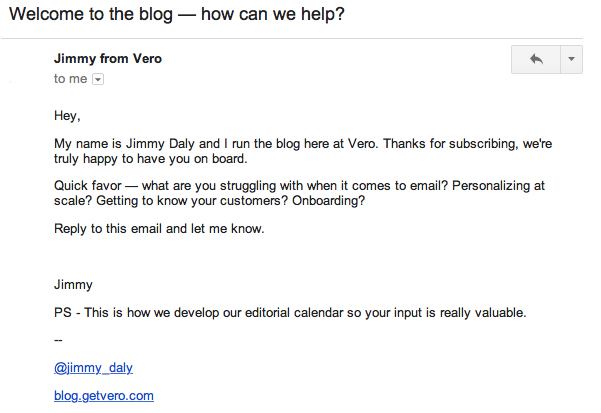 When I started with Vero about a year ago, we created a 14-step autoresponder that we sent to all new blog subscribers. The goal? To get them to signup for a Vero free trial. We sent that campaign to more than 2,000 people. Open rates ranged from 28 percent on the low end to 86 percent on the high end. We followed every email marketing best practice in the book. We even heard great feedback from some of our readers. Yet we netted just a handful of new signups from that campaign because we fell prey to a common misconception about content and email marketing. The reason our campaign failed is because we put selling before learning. When a new person subscribes to our blog, we know they are looking for more information about email marketing because it's clearly stated in the opt-ins. But we really don't know if they are looking for a new email marketing tool. Or if they are in a position to make a purchase.Or if they would even be a good fit as a Vero customer. Assuming that every person interested in your content is also interested in your product is a fundamental mistake. We learned that lesson by sending 19,849 emails that didn't do much (that's the total number of emails triggered in the campaign). It was time for a drastic change so we scrapped the campaign and replaced it with a single email. Not everyone responds but many do. In fact, more than 40 people responded in the first two weeks and I get few more responses each day. We are learning a ton. For example, some people are just getting started with email marketing. They are nowhere near ready to use Vero. Some have very specific use-cases. The webinars and content in our previous campaign would be way too general. Even an email marketing company has to learn that segmentation matters. Next Steps: Scaling and Optimization? The initial email is triggered when new people subscribe. That part is easy. The hard part is what to do with this information. For now, I'm responding to each and every email. File that under things that don't scale. It's a time-consuming process to send a meaningful responses to each person but so far, it's been a wonderful learning experience. The conversations often lead to specifics - blog posts that can solve their problems, frustrations with their current email tool and process, potential benefits of switching to Vero and so much more. Marketers love to automate and optimize. The time will come for that. For now, we're just getting to know our readers and their pain points in a whole new way. Be wary of false positives. As I mentioned before, we heard great feedback from some of the emails in our original campaign. That feedback didn't translate into revenue. Every business has one true metric. For us, it's signups. Everything else is a distraction. Don't jump the gun. Marketers want to optimize everything. Everyone wants a growth hack. Spend the time to get to know your readers, not just infer things based on Google Analytics data. My gut is that building relationships with our readers early will greatly increase the likelihood of a signup later on. When we have enough data to update this post, we will. Until then, keep learning.